Post: Happy 30th Anniversary to Frank Kruk! We celebrated a meaningful milestone this week here at AAA-1 Masonry World Headquarters: Frank Kruk's 30th anniversary at the company! Frank's name is synonymous with quality workmanship, integrity and patience. His expertise in this trade cannot be overstated, and he generously shares that expertise with his juniors—heck after 30 years on the job who isn't a “new comer” by comparison? 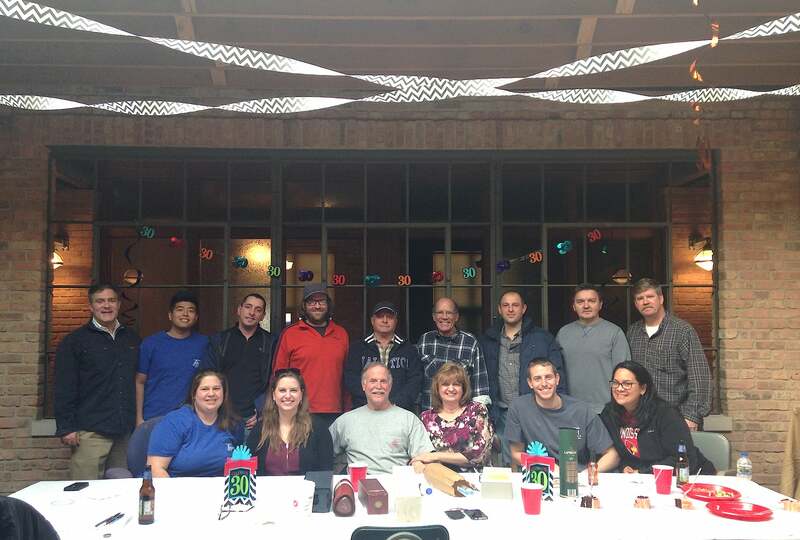 Frank started in the masonry restoration business 40 years ago and ran his own company, Fine Line, with his childhood friend Ken shortly after college (Ken's the guy in the back row of the photo, all the way on the right). Always ready for a challenge, Frank started shifting his attention to larger and more complicated masonry projects—you can read about some of these on our website—but has continued to dedicate considerable time to assisting homeowners with smaller repair projects like chimneys and stoop walls. Frank's productivity is legendary. Despite the self-imposed workload, he is a supportive husband and father. (That's Frank in the front row, center, flanked by his wife, daughter and son, Dan, who joined the company 5 years ago). Like the brick, stone and terra cotta he works with day in and day out, Frank is an enduring member of this company and the masonry restoration trade. If you require masonry restoration work of the highest order, give us a call at 773-622-7300 and ask to speak to Frank. You'll be very glad you did.